We both know you weren’t my first Jotter. That was in middle school, when I shared the joys of writing in a journal with another. By the time we had met, you and I had nothing new to show each other. We were both seasoned pros. And yet, my memories with you are unparalleled. For years, you fit in my shirt pockets and pants pockets, ready to leap out and, with a satisfying click of your spring-loaded plunger, smoothly glide across my paper, leaving a crisp black trail of ink. You were my totem, my personal prop–I knew you better than anything else I owned, and as the years went on, a part of my soul nestled itself in your barrel, wrapped snugly around your stainless steel cartridge. You were a part of me, and I was a part of you. No relationship is without its stumbles, of course; there were times when I neglectfully misplaced you in a backpack or a binder. When I wasn’t careful enough to put you in your proper home in my pocket, you sought a taste of freedom, of an untethered life. I can’t blame you, of course, but I want you to know that each time I thought I lost you, I tore through my possessions in a mad fit, searching endlessly for you. Without you, I was incomplete, and I can only imagine that a similar hollowness is what drove you back to me time and time again. And last year, you fell ill for months on end, amassing blobs of dark ink on your tip and tarnishing your perfectly pristine marks with smudges and puddles. I won’t lie, I often questioned whether you were still the pen for me, but I stuck through it, and when your sickened cartridge finally ran dry, I was overjoyed to nurse you back to health with a fresh one. You were my healthy, beautiful pen again, and I wanted no other. But in the long run, you outshone every other Jotter I had ever touched. You returned to me when I neglected you and you forgave me for doubting your writing. Unlike Jotter #2, who one day decided on independence and chose to no longer extend her tip when I asked it of her, you never broke down or refused to write for me. We were faithful to each other, and after years of this, from high school to college, I was sure that what we had could survive the even bigger leap of moving to another country. Was I naïve to so think? Were the sights of Japan so seductive to draw you away from me? Was your attachment to me cast into doubt by the towering skyscrapers and the neon lights? Perhaps I was more prepared than you, having visited before. Maybe I wrongly projected my security onto you. Surely, it couldn’t be that I trusted you too much. Or maybe, despite our years of learning Japanese together, the information overwhelmed you. After all, even I felt adrift in a sea of unfamiliarity. Perhaps the unending flow of incomprehensible language, coupled with the foolhardy confidence I may have imparted unto you, led you astray. Could it be that you misread a sign and lost your way in an unfamiliar country, without me to guide you? Whatever the cause, you’re not at my side anymore. I can’t find you in my pockets, my bags, or my desk drawers. Although I have hope that you might be patiently waiting in a lounge at school, the realization is finally setting in that this is the end. I’ve never been good at goodbyes. I would much rather believe that we will see each other soon, that you’ll return to me on a crowded train somewhere, lost and frightened, but poking out of the crack in the seat cushions where you fell out of my pocket. I like to think that you’re out taking a scenic tour of the railways, or that you’re enjoying Kyoto’s unique nightlife–activities that are fun and independent, but ultimately end and bring you back to me. I want to think this, but deep in my heart, I recognize that there is no second chance. Whatever the reason, you’ve left me, and now I have to create a new life without you. If you give me time, I’ll replace you. The Uni-Ball Signo I’ve been using in your absence is a barely passable stopgap, useful only instrumentally. Even still, she writes scratchily, giving out when I turn the corner of a character or try to dot an i. I can’t enjoy my time with her because every stroke only reminds me more of how deeply I miss you, and how incredible my time with you was. You have ruined me for other pens, but if I can’t have you back, I think I will have to find another. It’s a time of frightening opportunity for both of us. 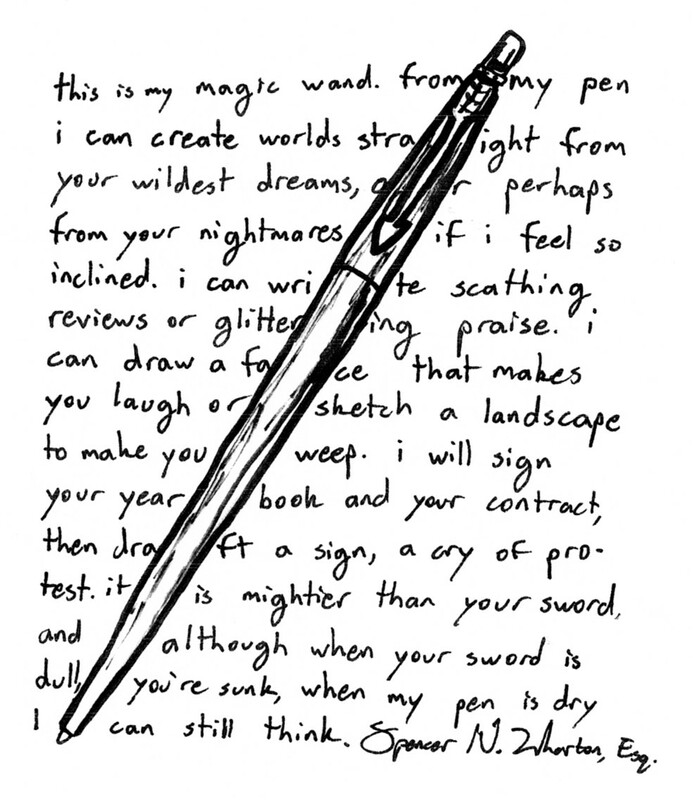 I could seize the moment and go out on a limb, trying to find a pen even better than you. Maybe what I need is an entirely different type of pen, one that stretches different parts of my hand. Maybe I can find one that fits me better. This is what I tell myself, but I think I know that I’ve developed a preference for a type. I know how harmonic a Parker Jotter can be, so another Parker Jotter I will seek out. This is hard. You may be hundreds of miles away by now, but that sliver of my soul is still nestled inside your cartridge, so no matter how far away you may be, without you here, I feel incomplete. Maybe part of this is coming to terms with the fact that no pen will ever replace you entirely–only complement the experiences we shared together. May you write boldly yet gracefully wherever you go. Thank you for the years of writing you gave to me.